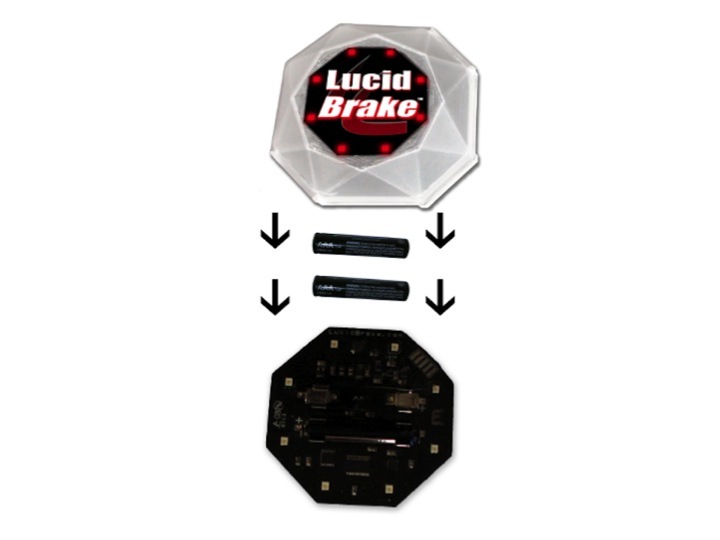 LucidBrake 2.0 is a motion sensing bicycle brake light which can be attached anywhere on the bike or its rider. When riding at a steady speed, the eight LEDs flash red, to alert other road users to the cyclist’s presence. Unlike the Iluminox light which we featured recently, the product works without being wired to the bike. An accelerometer detects that a cyclist is braking and changes the lights to show constant red, like a car’s brake lights. The light can differentiate between a cyclist slowing down or stopping and direction changes due to road bumps, climbing and movements of the rider. Hard braking results in a different lighting pattern to that when a rider is slowing down more gradually. The light can be attached to the bike or its rider using 3M’s Dual Lock fasteners, which are robust enough to hold fascias onto buildings, so should be well able to keep the light securely fastened. It does not need to be attached vertically, as it can compensate for the angle at which it is attached. There’s no on/off switch as the light senses when it is not in motion and puts itself in sleep mode. It weighs under 50 grams including batteries and is expected to run for a year’s normal use on two AAA batteries. The light’s circuitry is coated to make it water- and corrosion-proof. Lucidbrake has already made 250 of its first version. It claims better power management, instant on-off and new flashing modes for the new unit. The aim is to reach $10,000 funding on Kickstarter for an initial 150 unit production run. On 29th April it had under $4000 to go with six days until the end of the pledge period.